OWEN Jenkins survived some heart-stopping moments to collect his first winner’s trophy on the Cuestars Under-21 Bronze Tour at Salisbury Snooker Club. It was gone 9pm when the ten-year-old from Havant potted match-ball in the final. Jenkins, who had taken a 1-0 lead, said: “He made a good comeback in the second frame. I thought I could still win but I knew it would be harder than the first frame. 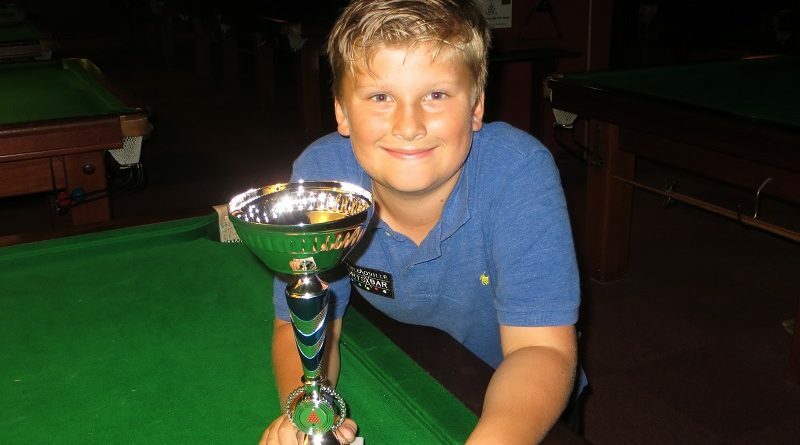 Cuestars debutant Smith, who increased his highest competitive break to 33 in the Rotary Summer Cup at Chandlers Ford Snooker Club, had beaten Jenkins in the group stages of the Attic Life-sponsored event. On his return to the Cuestars circuit, Adam Cowdroy (Bournemouth) went in-off the final black in the deciding frame of an epic semi-final battle against Jenkins. Thomas Sharp (Copnor), appearing in his first semi-final, lost 2-0 to Smith. Harry Rice (Newbury) won his group on his debut but lost 2-0 to Jenkins in the last-eight. Swindon brothers Jaydon and Taylor Elliott plus Eddie Mason (Salisbury) all qualified for the knockout for the first time. The second leg of ten is at Waterlooville Sports Bar on Sunday, October 7. ROUND-ROBIN GROUP A: 1st, Dylan Smith (Victoria SC, Tunbridge Wells); 2nd, Owen Jenkins (Waterlooville Sports Bar); 3rd, Lewis Wilson (Waterlooville Sports Bar); 4th, James Slade (Crucible, Newbury); 5th, Harry Wyatt (Chandlers Ford SC). ROUND-ROBIN GROUP B: 1st, Adam Cowdroy (Greenbaize, Bournemouth); 2nd, Thomas Sharp (Waterlooville Sports Bar); 3rd, Taylor Elliott (147 SC, Swindon); 4th, Thomas McEvoy (Salisbury SC); 5th, Will Kempson (Salisbury SC). ROUND-ROBIN GROUP C: 1st, Harry Rice (Crucible, Newbury); 2nd, Jaydon Elliott (147 SC, Swindon); 3rd, Eddie Mason (Salisbury SC); 4th, Katie Griffin (Jesters, Swindon); 5th, Freddie Turner (Salisbury SC). QUARTER-FINALS (12 points): Smith 2-1 T Elliott, Sharp 2-0 J Elliott, Cowdroy 2-1 Mason, Jenkins 2-0 Rice. SEMI-FINALS (15 points): Smith 2-0 Sharp, Jenkins 2-1 Cowdroy. FINAL (25/18 points): Jenkins 2-1 Smith.